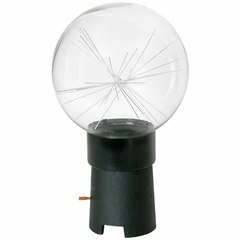 Simple and light table lamp; remember an illuminated envelope. Composed of an iron frame and an external tyvek paper coating. IVDESIGN.IT was born in Vicenza in 2007. It takes as a reference the man and his needs, configuring himself as a place of experimentation from which elementary responses are born to the needs of a society and of an evolving context. In fact, ivdesign's activity begins as a laboratory for the creation and sale of unique objects and design pieces; projects that address and respond to issues related to human life at home, at work and in play. ivdesign adopts an elementary but recognizable linguistic code where subtraction and simplicity translate into expressiveness, fruit of design intelligence. 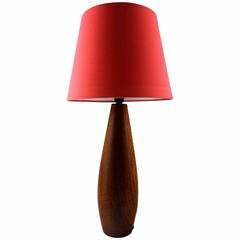 Danish design table lamp in teak. Shade in red fabric, Denmark, 1950s. Measures: Height 30 cm. Total height 46 cm. In very good condition. William Curry table lamp for Design Line. The enameled metal rods within the glass shade can be rearranged. Please contact us if you have any questions. Hand-thrown stoneware lamp with a swirling matte glaze in shades of green and gold, produced by Design Technics, circa 1950s. 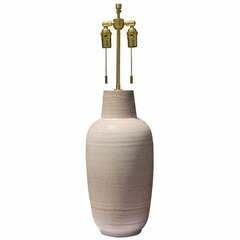 With original brass fittings, including the finial. A wonderful and subtle table lamp by Design Technics circa 1960 with a striated matte glaze with subtle drips in each line. Contemporary design table lamp with a square brass base under clear tubular glass rods surrounding a brass centre post and two internal glass rods with lights. 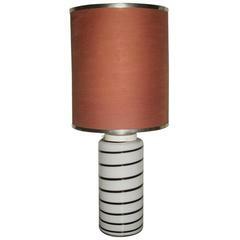 Dating from the 1970s a great looking corrugated cut spiral paper bulbous form table lamp in the style of Frank Gehry.